While I was onsite at a customer, one of the things I needed to do was to put in an extra power supply into a TurboIron switch. 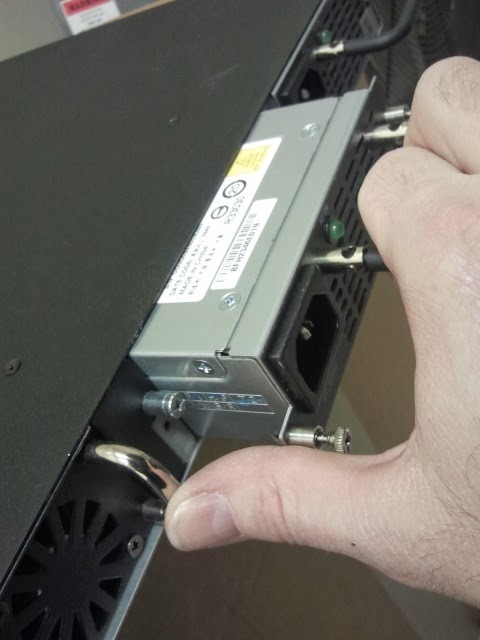 It had one already and was in production, but the customer wanted redundant power supplies in this unit, so I needed to get the second power supply in and operational. There is no magic to this at all. Its just put the module in and plug it up. That is all. You don't have to power down the unit either. Just plug the power supply in while in operation. Last September I a conversation with Brocade support regarding a power supply on one of my FCX648s switches. The DC light was red. I was always under the assumption that this meant the power supply was bad. I have two power supplies for each switch, so Brocade insisted that if the POE draw was not significant enough, the power supply would behave this way. I had done some rudementary trouble-shooting. The power supply did seem to "work" and all the info via the gui and the cli regarding the power supplies showed that all was well. So, I lived with that answer until recently. Our company moved to a new location and I had to move my network and my users. As the holidays went by and things settled down, I walked in my server room and saw that red light (again). Something just kept gnawing at me about it, so I did some more trouble-shooting. I put the power supply in other switches, but the red DC light still stayed on. So I did what I hate to do..I pulled the "main" power supply and sure enough, the switch crashed. At least, it seemed to power down. All the lights went out. Oddly enough, the fan still ran. I am contacting support again and demanding a new power supply, as it obviously won't work to the fullest capacity--as it is. I guess this is just an example of trusting your gut-instinct instead of the "pros".